Forget about fighting traffic and looking for a parking spot at the Seattle-Tacoma International Airport. Skip all the headaches associated with getting to the airport and travel with confidence — and without worry — by scheduling a private car. Choose from a 3-person sedan or an SUV or van that seats up to five people. Sit back and relax as a professional chauffeur drives from any downtown Seattle, Bellevue or Kirkland accommodation to the airport. Der Flughafen kann eine frustrierende und anstrengende Veranstaltung sein. Wenn der bloße Umgang mit dem Verkehr nicht ausreicht, besteht die Mühe, einen Parkplatz am Flughafen zu finden. Einen Parkplatz am Flughafen finden? Das ist viel einfacher gesagt als getan. Fragen Sie jeden, der es versucht hat. Es ist zu einem der nervigsten Elemente des Luftverkehrs geworden. Und wenn die Zeit von entscheidender Bedeutung ist (und wann nicht? ), Trägt dies nur zu Stress und Verwirrung bei. Der gesamte Prozess kann durch die Planung eines privaten Fahrzeugs mit einem professionellen Chauffeur festgelegt werden. Einfach kaufen, bestätigen und den Fahrer treffen. So einfach ist das. Mit der Wahl einer Drei-Personen-Limousine oder eines SUV oder Transporters mit Platz für bis zu fünf Personen ist es ziemlich einfach, Freunde, Familienmitglieder oder Kollegen, die an einer Geschäftsreise teilnehmen, mit einzubeziehen. Der Service von jeder Unterkunft in der Innenstadt von Seattle, Bellevue oder Kirkland zum Seattle-Tacoma International Airport ist rund um die Uhr an sieben Tagen in der Woche verfügbar. Daher ist es egal, wann der Flug abfliegt. Diese äußerst bequeme Form des Transports ist immer einsatzbereit. Best service with no troubles. Thank you. I was very pleased with the driver and the company. I was so thankful since we were leaving the hotel at 3:30 am that the company stayed in contact with me in the morning for arrival time! The driver was so kind and helpful! Thank you! Very disappointing. 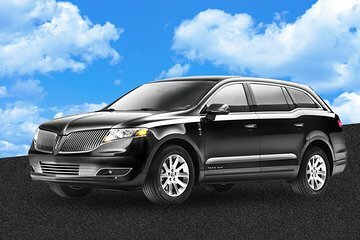 I had this private departure transfer booked from Fairmont Olympic Hotel Seattle to Seattle Tacoma Airport on Thursday 29 December 2016. My voucher indicated Carmel Limousine as our transport company. I had prepaid this voucher. I checked with the company the day before to confirm my reservation and timings and they confirmed same. At 8.10am Seattle time on Thursday 29 December 2016 I was contacted on my mobile phone by Carmel Limousines and they advised me they did not have enough cars and drivers to fulfil my transfer booking. They did not turn up as previously arranged at 9.00am that morning. Picked us up at the specified time and took us to the airport with no problems. Very nice to not not have to wait on a shuttle!! Great driver!! ok - just a transfer to the airport. On time 4am, courteous and helpful. Clean and comfortable car. The little things like chilled bottled water and tissues in the car made us feel much more special. This was a nice service, but we were told we would be met in the baggage claims area by someone holding a sign with our name. This was not the case however. After two phone calls to the car service we were told the car was there across the road waiting on us. There was no greeting and no one holding a sign with our name. After the initial confusion our driver was friendly and it was an easy trip into the city.